A couple years ago Toyota wised up and restyled its full-size Avalon sedan to avoid it turning into the Grand Marquis of Japanese makes. The more stylish lines, thinned taillights and overall slimed down look moved it from senior-citizen-mobile to family friendly sedan. Now comes the hybrid version that not only provides the same ride and comfort, but boosts gas mileage with its efficient hybrid system backing up a 2.5-liter I4 with variable valve timing. The result is a smooth running family sedan that at one point during my weeklong drive said it was getting 42 mpg. Try to find that in an SUV that seats five comfortably, or a sedan driven solely by a gasoline-powered engine. For the week I clocked 36.8 mpg in about a 50/50 mix of city and highway driving. 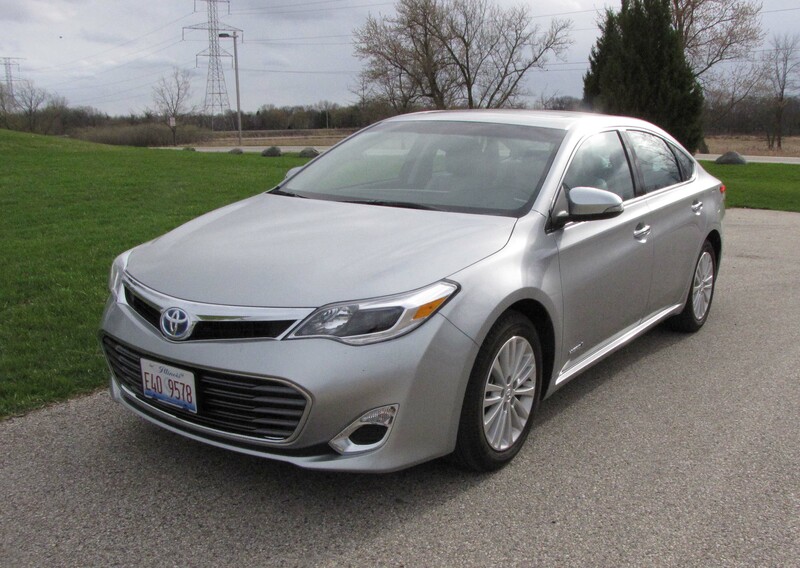 The EPA rates the Avalon at 40 mpg city and 39 mpg highway. That’s excellent! Only the Kia Optima hybrid I drove last summer topped that with 39.5 mpg in mostly highway driving. 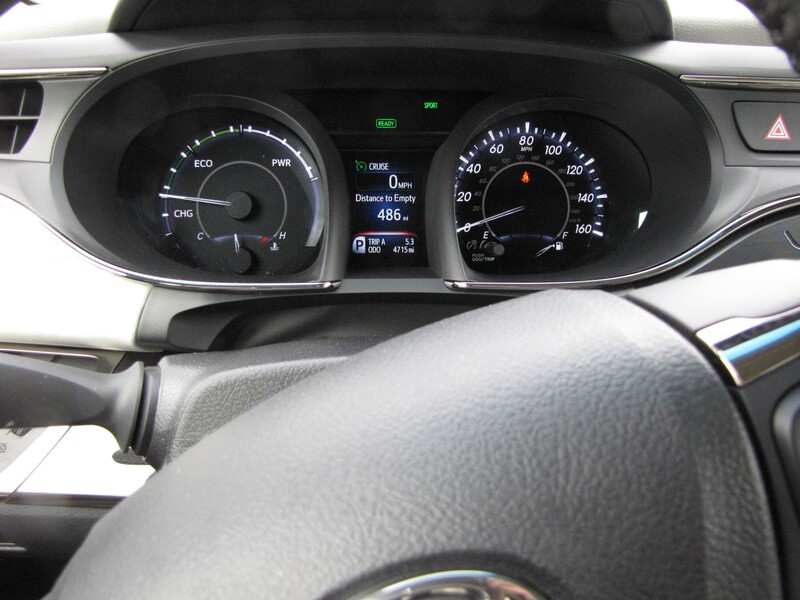 For the record, I managed 24.2 mpg in the gas-powered Avalon I reviewed in 2013. 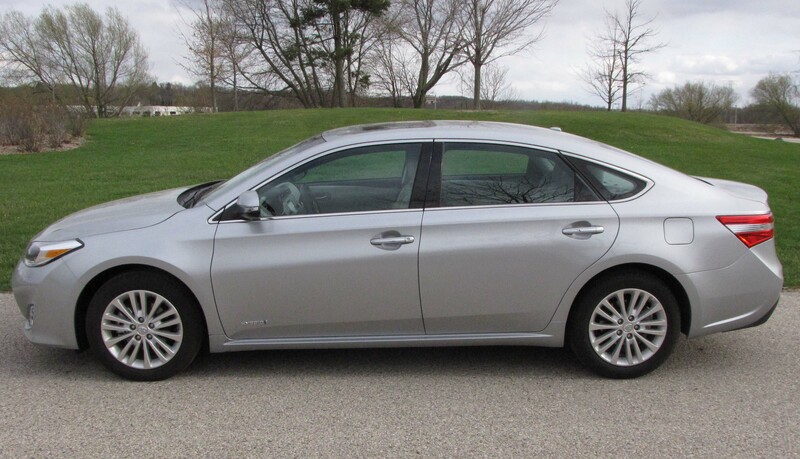 My metallic silver test car was the XLE Premium model, one up from the base model, but also with the hybrid system that stores energy in batteries and uses regenerative braking to repower those batteries. The hybrid system also powers an electric motor at low speeds when gas engines are at their least efficient. Outside of the car being incredibly quiet when you press the start button – no gas engine rumble – you’ll barely notice the hybrid system. Oh, there’s a little electric whine as you apply the brakes, but you’ll soon not notice. The test car lists at $36,470, a modest premium when you consider a base XLE with 3.5-liter V6 starts at $33,110. There are two higher-end models too, the XLE Touring and Limited, the top three lines all offering a hybrid option. 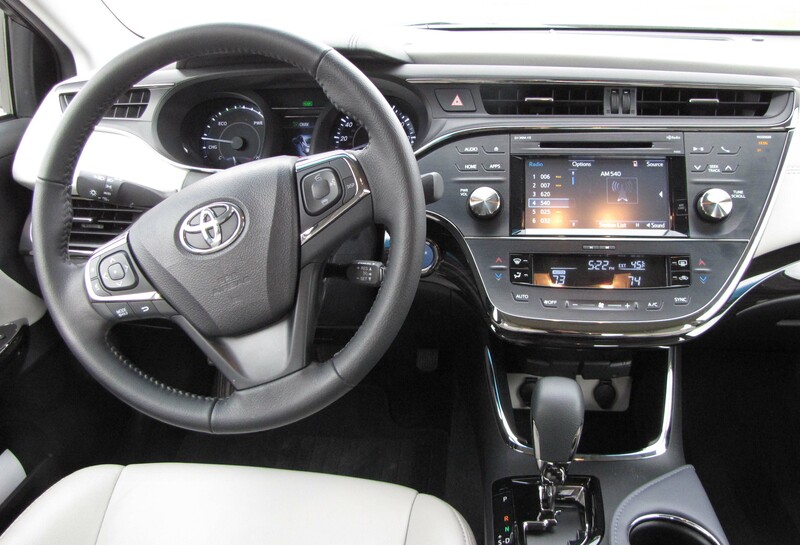 Toyota has wisely firmed the ride and steering enough that you feel you’re in a well-controlled sedan, no float or sponginess in the ride or handling. Avalon’s four-wheel independent suspension handles rough roads well, yet never feels sloppy, or too firm. The lengthy 111-inch wheelbase helps too. As I said in an earlier review of the gas-powered Avalon, steering feel is decent, but could still be tightened some. There is still modest play in the wheel, but steering effort is moderate and the car handles well in turns, just minor body lean. Turning diameter is 40 feet though, so slipping into a parking lot space requires a little extra room. 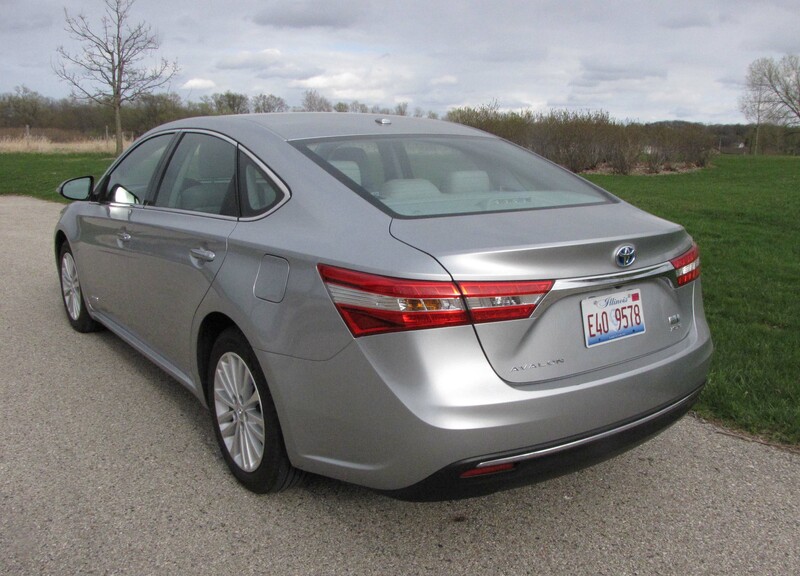 The gas engine in all the non-hybrid Avalon models is a powerful 268-horse 3.5-liter V6. That engine is Lexus smooth and works well with a seamless six-speed automatic. Engine noise is minimal. But the hybrid couples the electric drive system with a 2.5-liter I4 that is peppier than one might imagine with a smooth Continuously Variable Transmission. The hybrid and gas system creates 200 horsepower and a torque rating of 156. But the car doesn’t languish. In fact, press the sport button on the console and torque increases substantially, a good thing when entering a crowded highway. The car never felt sluggish, as some smaller hybrids do. Braking in Avalon is excellent with four-wheel discs along with traction and stability control. 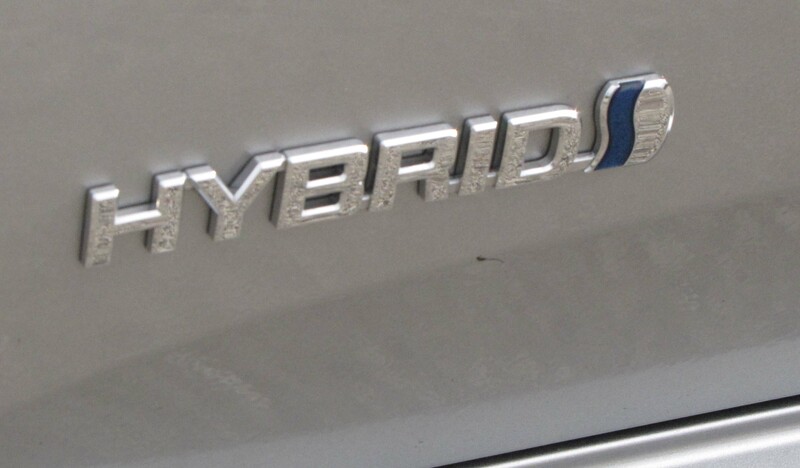 Note that the hybrid carries more weight than the gas-only powered model. This one tips the scales at 3,638, about 430 lbs. more than the gas version. You may notice the weight a bit when you put on the brakes, but after a few days a driver will quickly adjust, and this is still lighter than most SUVs and German luxury makes of similar size. Inside, the extremely quiet test car featured black over light gray leather with navy blue door armrests and console leather. The dash had some black wood-look trim on its face, but brushed black facing on the center stack, which featured touch controls. Unlike many such controls, these work well, even while a driver is wearing gloves. That’s rare. All gauges were well placed and easy to see with a digital trip computer readout between the main gauges. Atop the stack is the radio screen, which will split to include the navigation screen. Or you can expand either to fill the full screen. There is a large radio volume knob and tuning knob too. If all radio systems were this easy to use and figure out in cars we’d all be thankful. There’s a manual tilt/telescope steering wheel that’s wrapped in leather, and features radio, phone and trip computer buttons on the wheel’s hub. Behind the wheel, Toyota keeps its cruise control on a stalk. That’s a bit old school, but the Avalon features push-button start. Avalon also comes with dual climate control buttons that are simple to see, and use. Under the center stack is a good-sized cubby, plus a place to plug in an iPod, along with several other outlets. The center armrest is well padded and there’s storage beneath that too. Avalon’s seats are exceptionally comfortable and both front seats are powered. The driver’s seat has a power lumbar support that can be moved up and down, enabling tall and short drivers to get comfortable. However, the passenger’s seat is mounted way too low and does not feature a height adjustment, a major faux pas that could be a deal breaker if the spouse or other front seat companion is short. Rear seat legroom is monstrous, so five adults will ride in comfort. Overhead the Avalon features a sunroof, plus visors that slide. It’s surprising how many pricier cars do not feature such flexible visors. Avalon also has a good-sized trunk at 14 cubic feet. That’s 2 feet smaller than the gas-powered model’s trunk, and the rear seats do not split and fold. That’s because of the hybrid system and its batteries mounted under the floor in back. With a $795 delivery charge, $225 for carpeted floor mats (really, that’s still extra?) and $935 for the Entune Premium audio system with navigation, the test car hit $38,455. That’s still more than a gas-powered model, but let’s face it, you’re gas mileage is much superior and the quiet level inside the cabin is all the greater too. If more hybrids are this good they could well become the dominant vehicle on our roads in a few short years. Hits: Handsome styling, excellent ride, good power, smooth shifts and excellent fuel economy. Comfortable, quiet interior with well-shaped seats that will hold 5 adults comfortably, plus simple, logical dash controls with touchscreen that functions well, heated seats, heated outside mirrors and sunroof. Misses: Steering feel could be firmed some more and the passenger’s seat is mounted way too low. Its height needs to be adjustable.